Credit cards can have a bad reputation as a symbol of financial irresponsibility, relied upon by those who cannot keep their spending under control. Of course they’re not for everyone, and can become a significant drain on the disposable income of those who aren’t careful. If used correctly, however, that bit of plastic can be more beneficial than burdensome - and may even help to improve your financial well-being. You should always treat a credit card for what it is - a loan rather than free money. To that end, ignore flashy introductory offers and look at the rate of interest (APR) that will be charged on anything you owe. Be clear on the maximum amount you can borrow at any time (your limit) and the minimum you need to pay back each month to avoid a penalty (usually a percentage of what you owe). If you travel a lot or shop online on US or British websites, it may also be worth checking what charges apply on foreign exchange transactions. None of these things should affect you if you’re smart in how you use your card, but it’s good to be aware of them nonetheless. If possible try to make sure your card account is accessible online, as this will make it easier to monitor and manage. As you start to put your plastic to use, keep that ‘loan not cash’ mantra running through your head. Just like you wouldn’t borrow from your bank to buy a coffee, you should avoid using a credit card for everyday purchases. This is particularly true when it comes to withdrawing cash - as banks will charge you extra each time you do so. Instead, keep your credit card for bigger ticket items; the kind of thing that might be easier to pay for over a number of weeks rather than in one big chunk. And once you use it, aim to repay the money as quickly as possible. Do so within the month and, no matter what APR your card has, you won’t be charged any interest. This essentially makes your credit card an interest-free, short-term loan. At the absolute least, though, you should make sure that you pay the minimum required each month while always sticking within your card’s limit. This will ensure you avoid any Late Payment or Over Limit Fees - while also keeping your credit rating in a healthier place. If you only do the bare minimum the bank will apply that high interest rate, however, and the amount you owe will start to tick up. Using your card while paying off as little as possible is a sure-fire way to fall into the credit card debt trap, but should that happen there are simple ways to right the ship. For a start - stop the rot. Each time you use the card you add to that debt pile, so put it on lock-down until your balance is clear. Next, see if your bank is able to offer you a reduced APR - even temporarily. That would cut the amount of interest being piled on each month, meaning you’re running up a slightly less-steep hill as you try to pay it off. If your bank can’t (or won’t) budge, check the Competition and Consumer Protection Commission website to see if you can get a better offer elsewhere. A card that allows balance transfers will send what you owe from your one account to the other, making your debt subject to the new (lower) interest rate. This is also where those flashy offers come in handy. A move to a card offering a 0% introductory rate means you won’t be charged any interest for a fixed period - giving you extra breathing space to clear the decks. From there it’s simply a case of paying as much as you can each month. If you have multiple card balances to clear at once, consider following the ‘Debt Snowball’ method. This involves you making minimum monthly repayment on each card, with any remaining funds going off the card with the smallest balance. Once that is clear, all of the money that had been going towards it is rolled over to the next lowest balance - and so on until all cards are clear. At that point you should also consider cancelling your additional cards so that you only have to worry about one balance in future. You can check the CCPC’s credit card calculator to see how long it will take to clear your credit card balance based on how much you owe and how much you’re able to pay each month. If it looks as though you’ll be stuck in credit card purgatory over the long term, it may be worth getting a Credit Union or bank loan to clear your balance. While your own Credit Union may offer a better rate, the maximum APR they can charge is 12.68%. That means it’ll cost you around €350 to repay a €5,000 loan over the course of a year, compared to almost €820 on a card with a 29% APR. Just be sure not to add debt back onto your credit card the minute you’ve gone to the effort of clearing it! Once you’ve mastered the art of interest-free borrowing you may begin to find some other perks of credit card use - by far the most valuable of which is protection against fraud. If your card is used - online or offline - without your permission, if you make a purchase but never receive the goods, or if there is an issue with what you do receive you can ask your bank for a refund through a Chargeback. In addition to this, individual card providers have also begun to offer reward schemes once again. The incentives on offer are fairly small; for example Bank of Ireland allows card users to build up SuperValu and Aer Lingus points as they make purchases, while KBC offers up to €10 cash back on some purchases. Not enough to make you change the way you bank - or shop, for that matter. 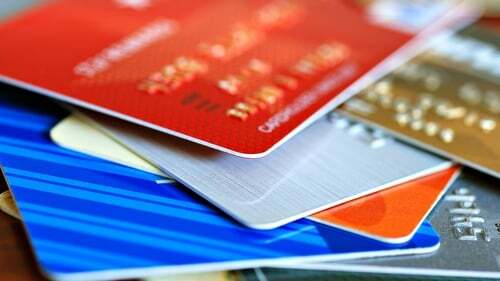 But it is another small way in which you can make your credit card a contributor, rather than a drain, on your personal finances.